John Stokes – father of Celtic player Anthony – may be forced to scrap the banner in order to retain his pub’s licence. A DUBLIN LANDLORD and father of a player for Celtic FC may be forced by Gardaí to remove a banner from outside his pub, proclaiming that the Queen is barred from visiting it when she arrives in Ireland next May. The banner continued to explain that the Royal family would not be welcome “as long as the British occupy an inch of this island”. Stokes – the father of Celtic and Republic of Ireland player Anthony Stokes, 22 – told yesterday’s Liveline, however, that he was facing a Garda order to remove the banner, with officers saying the banner ‘incited hatred’. The Sun quotes a Garda sources as indicating that if “the banner is still up next week, then we will draw the judge’s attention to it” when Stokes returns to court to secure his liquor licence for the bar next week. The banner was not meant as a personal insult, he added, saying it had merely been displayed to stop the Queen from the embarrassment of being turned away if she happened to show up at his bar, which he said was well-known. There is precedent for Stokes to be forced to remove the banner: as the Irish Examiner explains, builder Mick Wallace – who has since become a TD – was made to remove a banner opposing the war in Iraq from one of his building sites. On that occasion, Gardaí said the statement was a political one, and that such banners did not enjoy the same freedoms given to more straightforward advertising. Stokes has insisted that the banner does not represent the political opinions of his son, whose boss Neil Lennon and teammates Niall McGinn and Paddy McCourt have all been subject to sectarian death threats in the past few months. “This has nothing whatsoever to do with Anthony,” Stokes said. Stokes’ bar is a well-known hangout for Celtic FC supporters, and has over 70 televisions inside on which soccer matches are aired. Email “Fairview pub may be forced to remove ‘Queen is barred’ banner”. 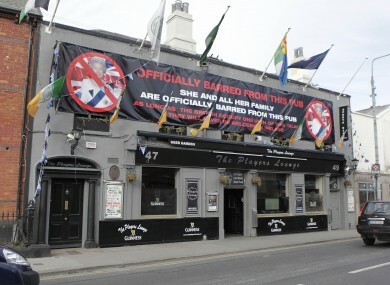 Feedback on “Fairview pub may be forced to remove ‘Queen is barred’ banner”.